No one can definitively predict how human behavior and decision-making will affect greenhouse gas emissions on a global scale. Considering human actions, however, is key to understanding what future climate change impacts may occur. This is why developing scenarios based on a range of different storylines about how society might change in the future is important. Effective scenario modeling efforts need to consider a wide range of political, economic, technological and social possibilities that bracket the range of what is “possible”. Of course, defining what is possible is subjective, and in this sense scenario planning is an art as much as it is a science. There is a need to have common social and economic scenarios for climate modeling teams addressing different questions at different scales and regions. Having common scenario reference points facilitates comparison of model outputs and integration of results. 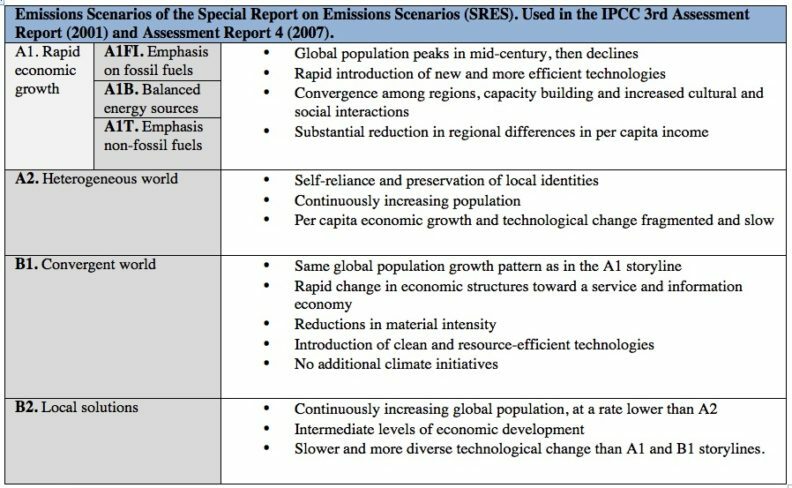 With the Special Report on Emissions Scenarios (SRES), published in 2000, the Intergovernmental Panel on Climate Change (IPCC) led the way in establishing a global, agreed upon set of scenarios describing global-scale behavior and decision making. The IPCC 3rd Assessment Report (2001) and 4th Assessment Report (2007) considered six families of SRES scenarios, with variable levels of economic vs. environmental focus and variable levels of globalization vs. regionalization. SRES scenarios were designed as neutral baseline scenarios. They do not claim to represent all the possible social changes humanity could encounter between now and 2100, but they do allow for comparison of a range of economic and political futures that would lead to different greenhouse gas emissions. See the table at the bottom of this article for an explanation of different SRES emissions scenario families. At the same time that climate models have evolved (newer CMIP5* global climate models represent more processes, and in greater detail, than earlier CMIP3 climate models), the IPCC’s approach the scenario modeling has also evolved. In the IPCC 5th Assessment Report (2014) analyses of future emissions and impacts are based on Representative Concentration Pathways (RCPs). RCPs are a set of future greenhouse gas concentration trajectories. They are not associated with specific assumptions about economic, political, or technological conditions. The four RCPs considered in the IPCC 5th Assessment Report are named according to projected radiative forcing — sunlight absorption– values in the year 2100 relative to pre-industrial values (+2.6, +4.5, +6.0, and +8.5 Watts per square meter). As you can see by comparing the graph on the right to the one on that left, the new RCP scenarios capture a greater range of possible global average temperature change than the SRES scenarios. At first glance, more variability in model projections and less specific social, economic and technological scenarios may not seem like progress. But the shift to focus on modeling greenhouse gas concentration trajectories actually simplifies interpretation of global average climate change projections for decision makers. The connection between emissions and temperature change is made explicit. In analyzing model outputs for different RCP scenarios, there is room for debate and discussion about how different social, economic and political changes might bring about changes in emissions. By shifting the focus from SRES scenarios to RCP scenarios, a broader range of possible futures are being considered and there are improved opportunities for comparison and linkage of different climate impacts models. *CMIP stands for Coupled Model Intercomparison Project. CMIP3 and CMIP5 refer to iterations of General Circulation Models developed to simulate global climate. Liz Allen is a graduate research assistant in the School of the Environment at Washington State University where she is a member of the BioEarth Regional Earth Systems Modeling team. This entry was posted in Climate Modeling, Greenhouse Gas Emissions, Impacts & Adaptation on May 11, 2015 by AgClimate Admin.